Copyright 2009 Debbie A McQueen, All Rights Reserved. Herd Testing for CL, CAE, Johnne's and Brucella last done December 2016. All our goats were tested and all came back negative. To see the kids, click *here*. 2 moonspotted bucks available. See "Buck" page. 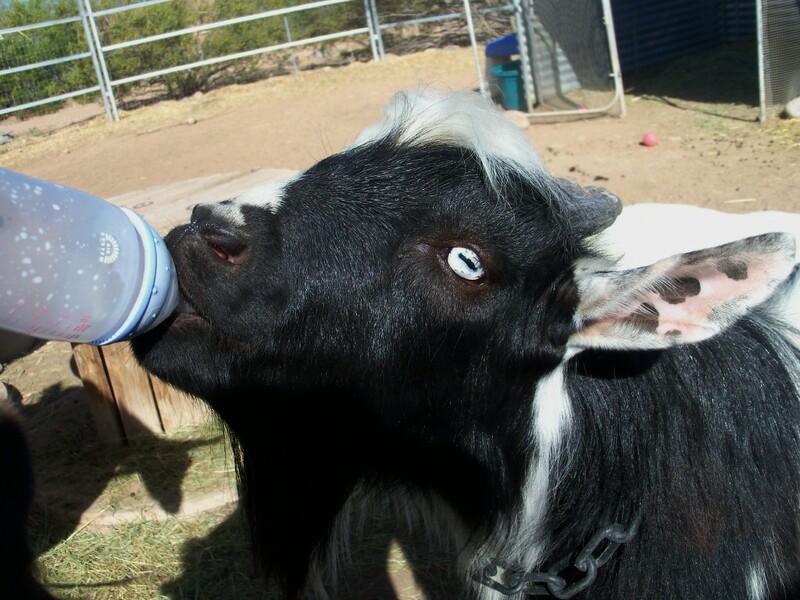 At KDC, we do NOT breed goats with teat spurs or other physical defects. And with few exceptions, we only breed our does every other year. 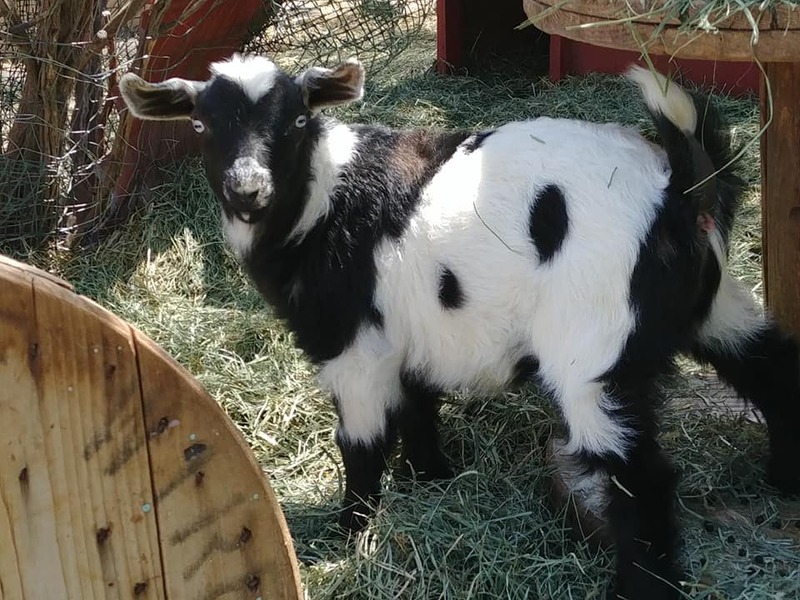 Nestled in the saguaro studded foothills of the Sonoran Desert, Kiva de Chaco's is home to a small herd of Myotonic and Mini Silky Fainting goats. Our goal is to produce healthy, happy and structurally correct goats that not only conform to breed standards, but that also raise the bar. 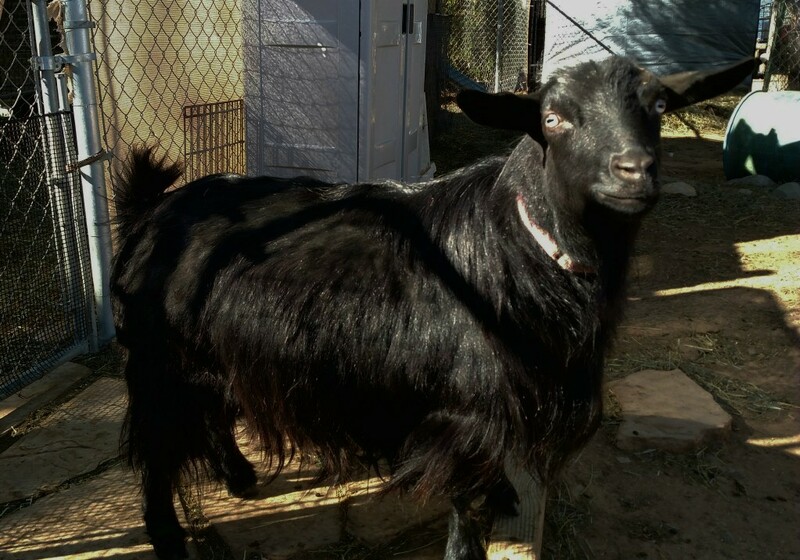 Our foundation goats came from various breeders across the US whose herds tested negative for CL, CAE and Johne's Disease. 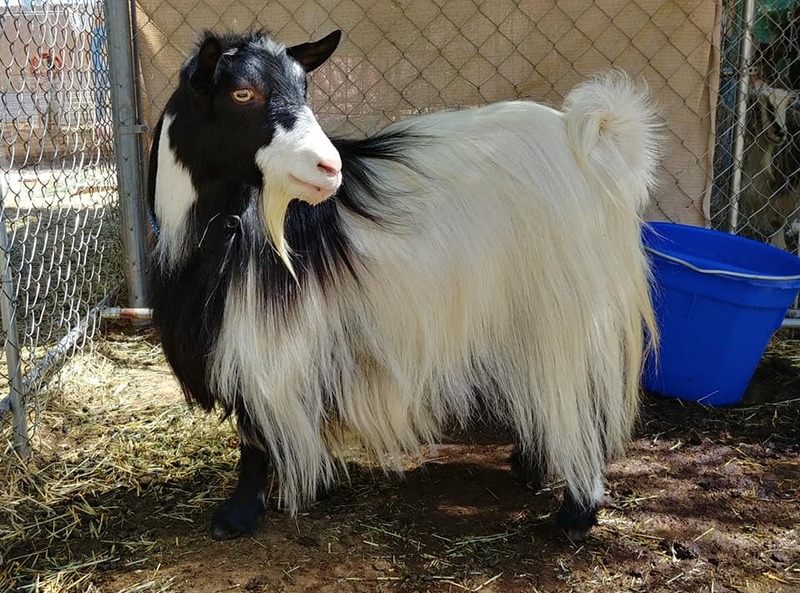 At the time, we were the only breeder in the state of AZ registered with the Myotonic Goat Registry and the Mini Silky Fainting Goat Association. In April, 2012, we began herd testing for CL, CAE, Johne's and Brucella here at Kiva de Chaco's. All of our goats were tested including kids under 6 months of age. We are proud to report the results were all negative. Our herd is now officially closed. We will be testing again in Fall 2019. Our alpaca girls, Snow, Theadora, and Rita serve as sentinels here at KDC. Housed with the does during kidding season, their presence and size effectively deter predation of our baby goats by raptors and bobcats that used to frequent our farm. 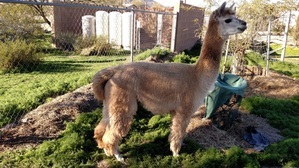 Since acquiring the alpacas, we no longer have to lock our kids and their dams up in stalls at night or keep the new families in fully enclosed nursery yards during the day until the kids grow large enough not to be considered prey. This makes our job of managing the doe herd a lot easier and less time consuming. 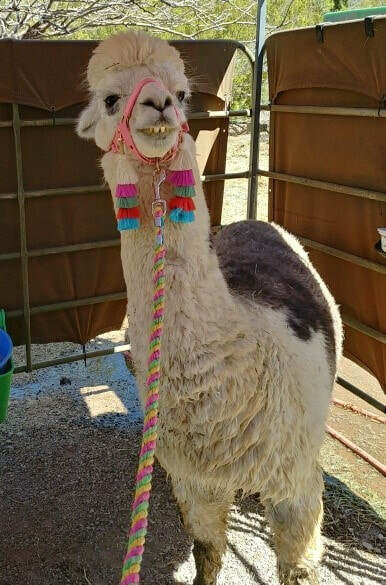 We also added a small yet mighty Suri llama, Jorja, who patrols and guards the pacas and the goats. 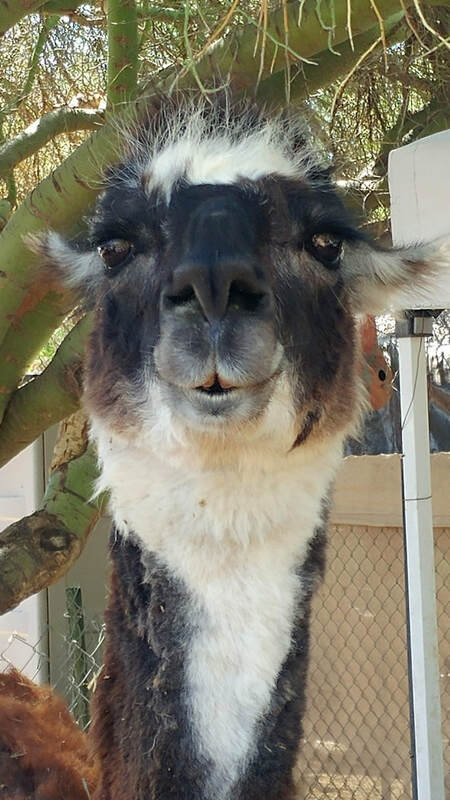 More recently, we brought on a second llama, Ember, who is a sweetheart. 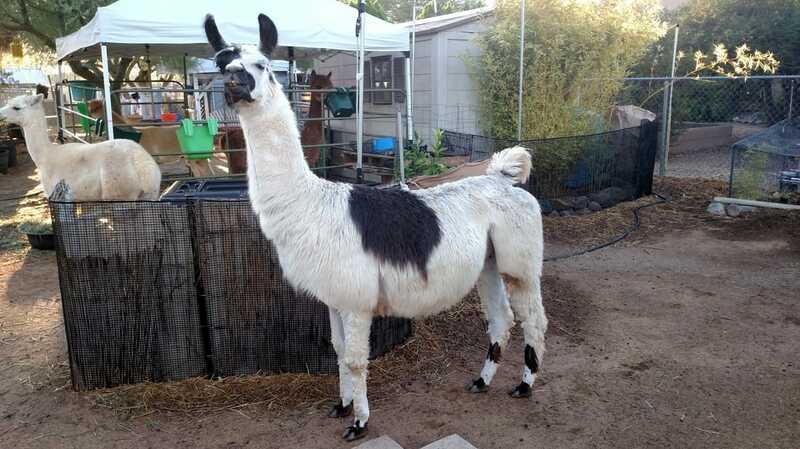 Born on Halloween, she's an intense red with grey, black and white accents and has a pleasant temperament. Since losing Chaco, my choredog, best friend and partner in stock, Jorja helps me round up and herd the goats into their yards at dusk. The camelids bonded with the goats without event and are earning their keep. We're happy to have them on board. 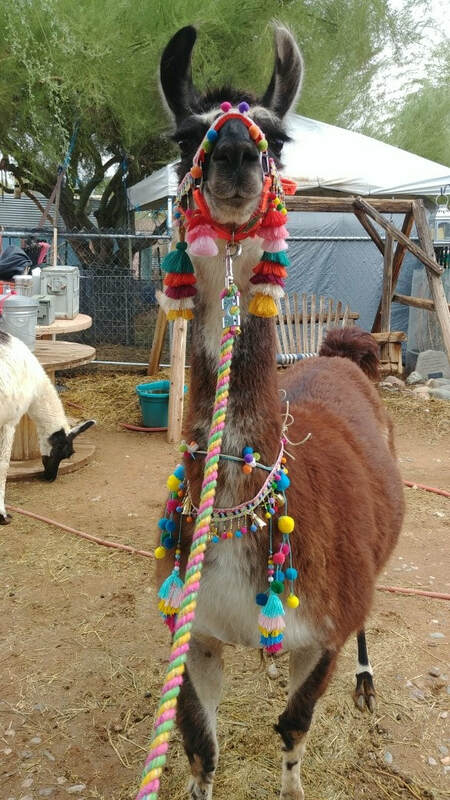 All in all, we have a great lil herd of camelids. 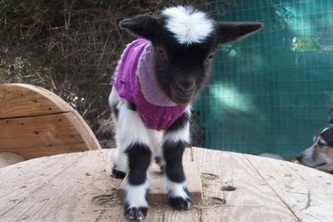 I am unable to travel so do not show our goats. Nonetheless, I enjoy showing them off and, as time permits, do participate in some of the virtual fainting goat shows on the Internet. Avoiding contact with other goats and livestock at such gatherings does have an upside: it reduces the risk of disease transmission to our herd. 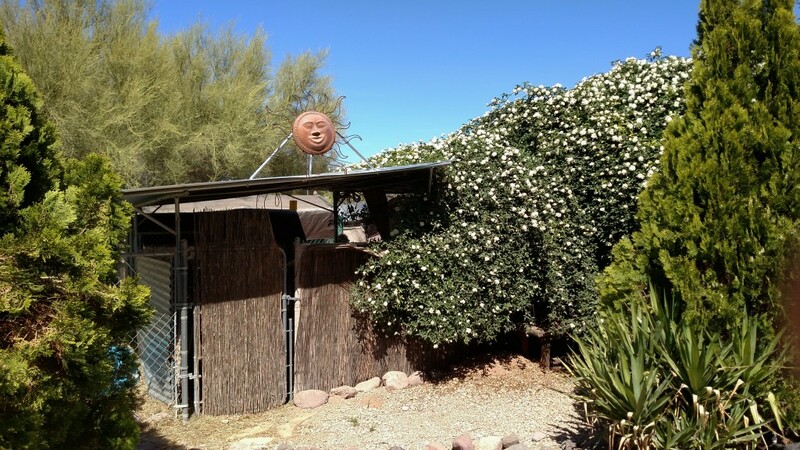 Kiva de Chaco's is located in Desert Hills, Arizona, a small rural community north of Phoenix and east of I-17. We are a registered breeder with the Mini Silky Fainting Goat Association (MSFGA) and the Myotonic Goat Registry (MGR). 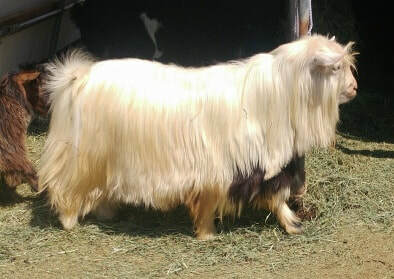 Each and every one of our foundation goats was selected for certain desireable traits and is breeding quality or better. Each and every one is showcased on our website. What you see is what we have. 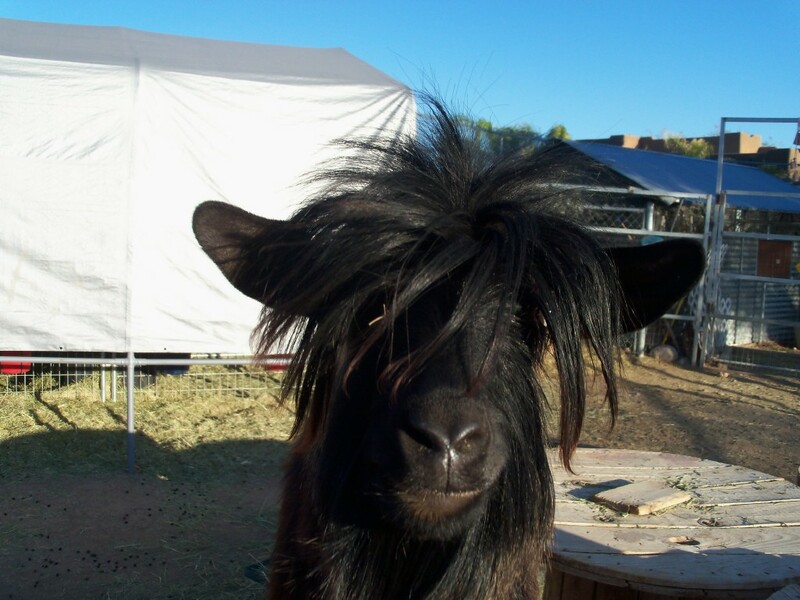 We take pride in our goats and in our ownership of them. Kiva de Chaco's is about quality not quantity. 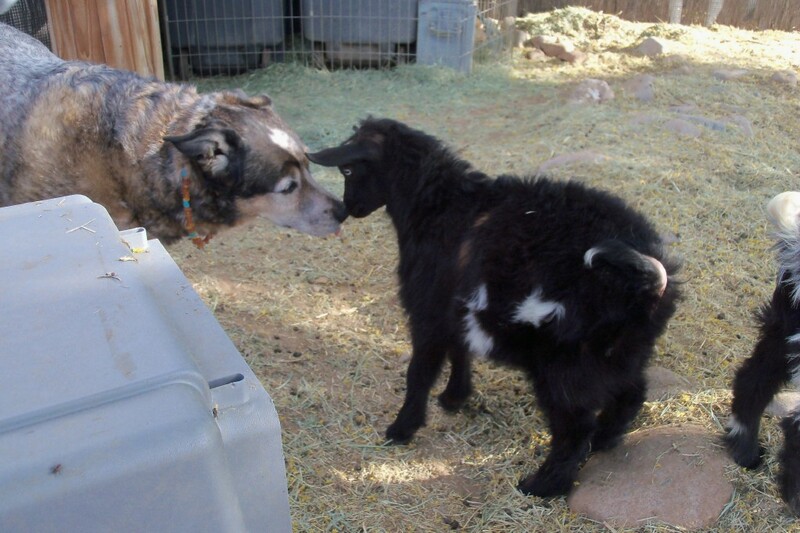 Our farm's namesake was my best friend and partner in stock, Chaco Louise. Chaco is why we have a farm. I got her to train for mobility assist as a service dog. She was great at it but needed a more fulfilling job. 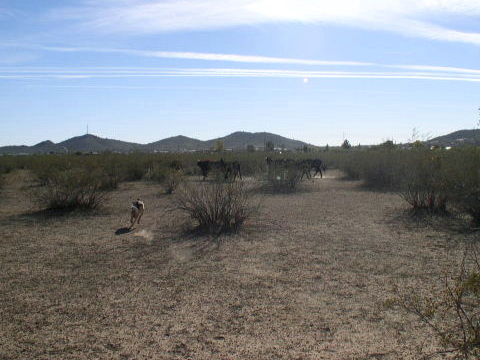 So while still a pup we took herding/handling lessons, started a farm and together we built Kiva de Chaco's. Catahoula Leopard Hound X Australian Cattle Dog, Chaco was a fierce herder and could work about anything, from sheep, goats and range cattle to waterfowl, wild quail chicks and wild burros, and even singles! Yet she could be exceptionally gentle and exhibited strong bite inhibition, never applying more force than necessary. Chaco always looked forward to kidding season. She loved the baby goats more than anything. Well, she also liked to enforce rules. 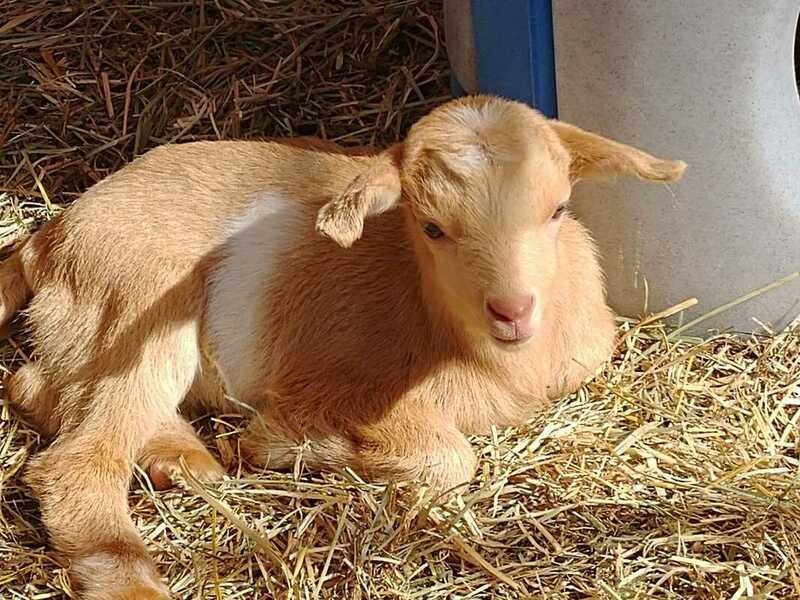 Each of our animal yards has a different set of rules specific to its occupants and she learned and enforced them all, teaching the young goats manners and keeping order. 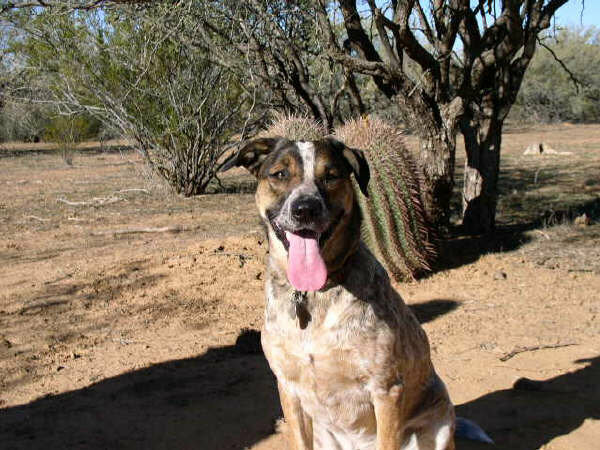 Catahoulas are independent thinkers but first and foremost, Chaco was my partner. "Kiva" is Hopi for womb of the earth. Sadly, my talented and beautiful girl transcended the ladder of life and crossed over the rainbow bridge on February 26, 2016. She remains close to heart now herding clouds and managing stock in the heavens. Her earthly legacy lives on in the form of Kiva de Chaco's Fainting Goats. 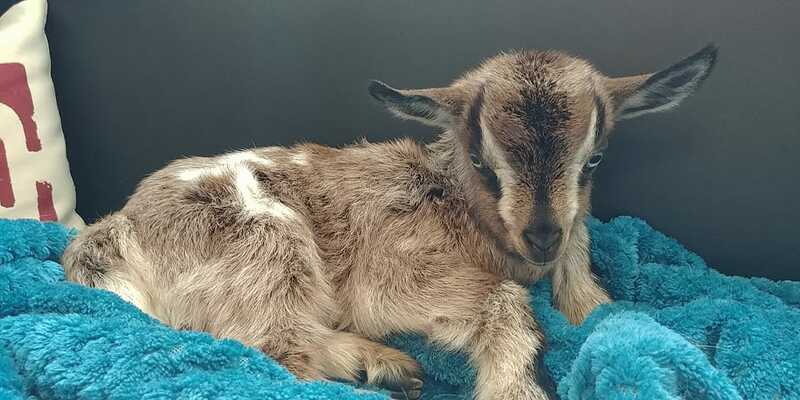 We are more committed now than ever to producing top quality fainting goats, in honor of Chaco Louise and her years of service and unconditional love. 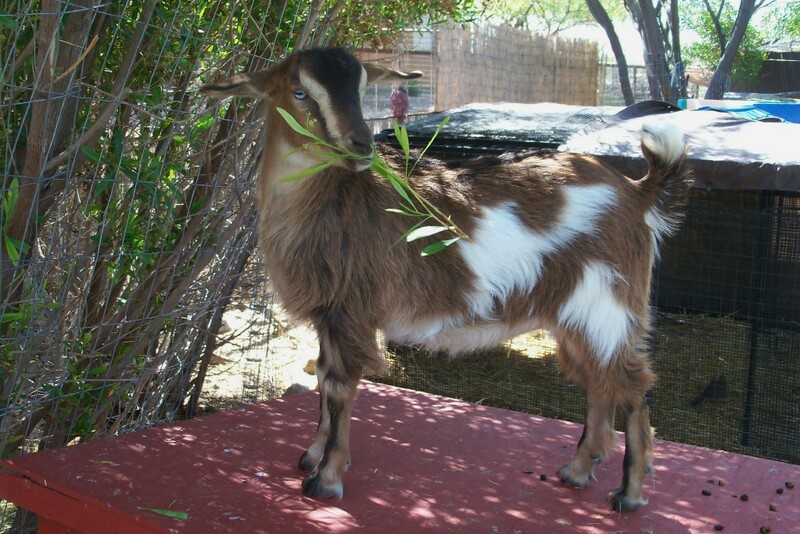 We raise fainting goats for breeding, show and pets. 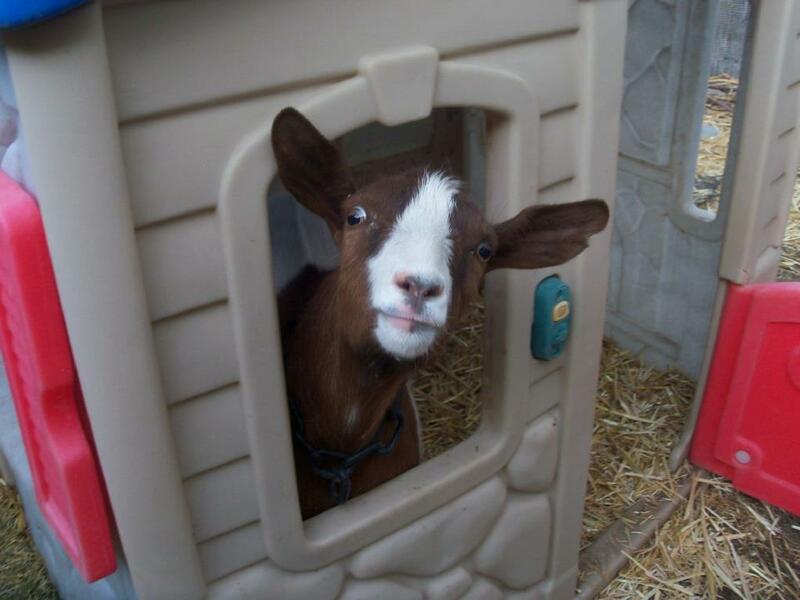 We place our goats in appropriate homes and reserve the right to refuse sale if we feel placement would not be appropriate. Our goat kids are family raised and receive lots of handling including individual one-on-one human attention from the very get-go. They are CDT vaccinated, vet checked and registered with the respective registry before being sent off to their new homes. All kids going out of state will need a valid health certificate. That cost, along with those associated with shipping, is the buyer's responsibility, as is finding and making arrangements for any transportation needs. Please don't let transportation be an obstacle to getting the goat you want. We can recommend the services of several livestock haulers that we have used ourselves, and would be glad to provide contact information upon request. It is up to the buyer, however, to make the arrangements and pay for those services. We will do all we can on this end to assist and make your experience at Kiva de Chaco's as enjoyable and as hassle-free as possible. 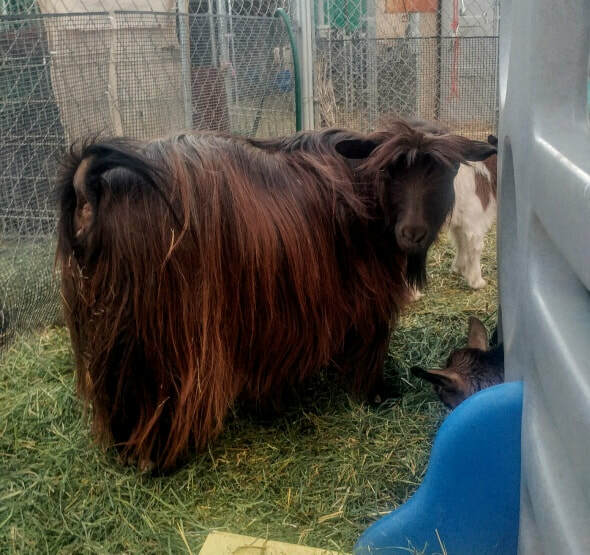 For more information about our goats, please feel free to contact us by email by clicking *here*, or by calling (six 6 two 2 three 3) six 6 eight 8 zero 0 - zero 0 five 5 seven 7 three 3. This website and its contents are copyright of Debbie A McQueen 2009-2016, All Rights Reserved. Any redistribution or reproduction of all or part of the contents in any form is prohibited. You may not, except with the owner's written permission, distribute, copy or commercially exploit the content. Nor may you download, post, transmit or store any part thereof in another website or other form of electronic retrieval system. Thank you! Important things you ought to know prior to getting fainting goats as pets, click * here*. 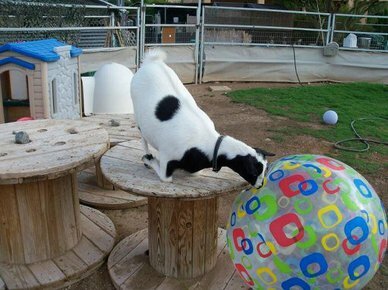 For information on the Myotonic Goat Registry, click * here *. 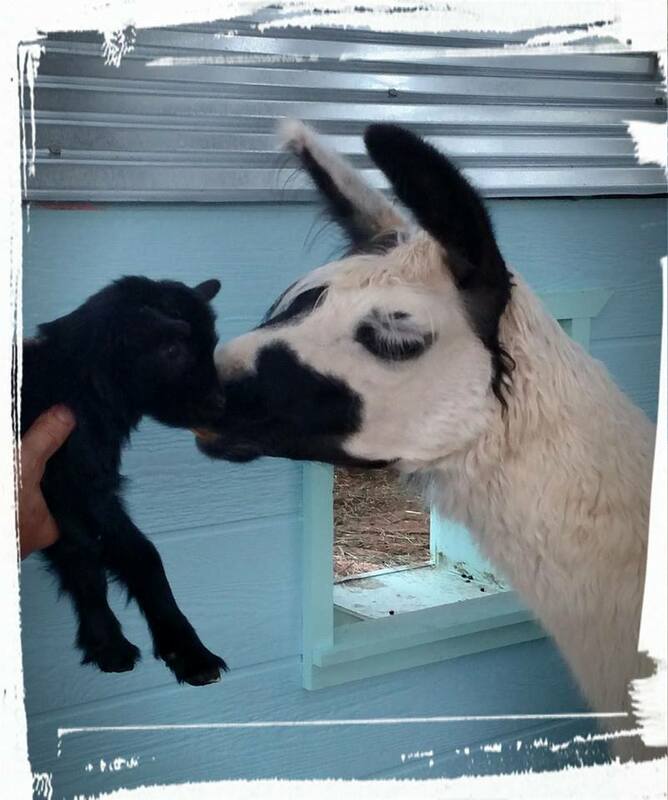 For locations and links to Other Fainting Goat Breeders in the USA click *here*.